Colors, Shapes and Musical instruments collide in Paul Brent’s “Abstract Sax.” Painted in a cubist style with warm reds, golden yellow and rustic browns, this abstract interpretation of a band visualizes the sound of jazz instrumented. 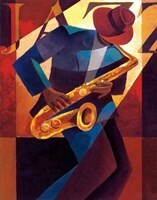 Including an acoustic bass, piano keys, two saxophones and different musical notes, this painting reproduction is perfect for a musician or Jazz lover. Best framed in gold to compliment the brass sax or black to make the image pop, abstract sax will add color and music to any home.